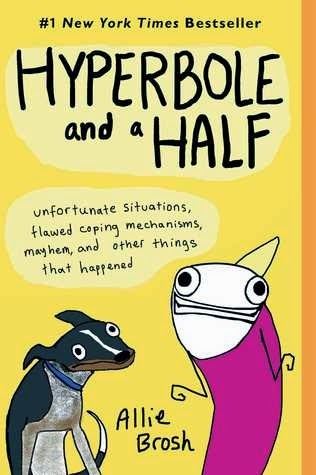 This has cropped in my review feed a couple of times recently which reminded me that I've been eager to read it for some time now; I *love* Allie Brosh's blog. Luckily, my local library's magical online catalogue revealed they had a copy so off to town I went. I actually ended up wandering around my library for about fifteen minutes feeling confused because I couldn't find the 800's - they turned out to be on the mysterious third floor up to which I'd never been but will again. There were some people having a croissant party. You don't get things like that on the second floor. The second floor was full of children singing "The Wheels On The Bus". Brosh is rather like David Sedaris if Sedaris chose to illustrate his books with all the tools MS Paint has to offer. Like Sedaris, her likeability for me turns out to be dependent on the medium through which she is filtered. Unfortunately, its not high with this book. As others have commented, the transfer from blog post to book does not serve Brosh well. The fact that so much of this is recycled material - I'd forgive a third, just about, but this is closer to half - only highlights the problems: when the images are shrunk down they lose their impact significantly and this is especially noticeable in stories such as Depression - I've read it dozens of times and will probably read it dozens more, but in physical form it's nothing. It's also disappointing that the strongest stories are the old ones - like The God of Cake and Depression parts one and two etc. I did really like a couple of the new ones, especially Lost In The Woods, but I actually ended up skimming the last few stories. I got this from the library but had I parted with money I would certainly consider it a waste of. It's fun, but I don't really see the advantage of Hyperbole in book form - there's not enough new stuff and old stuff becomes significantly less entertaining. 2 stars.